Your home is one of the most expensive and important purchases of your life. If you own or rent a commercial property, the situation is also very similar depending on the business. Over time, a home or building’s exterior is exposed naturally to a variety of severe weather elements and conditions. Due to that exposure, the roof may become subject to significant wear and tear that inevitably results from the extreme thermal expansion, contraction, algae, moss, and more. Also all of that wear and tear can lead to discoloration, tiles needing to be replaced because of peeling, cracking, blistering and delamination. These issues can really hurt your building’s worth and the integrity of the roof. Ceiling temperatures are higher in your building and there will become an increase in money spending on energy bills in order to cool the building. This is why should the time for you to restore your building’s tile roof, you will need to know the options that will satisfy your needs for years to come. 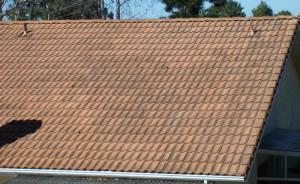 First and foremost, you will want a simple, easy consultation on what your roof needs. In order to restore your tile roof back to what it once was, you might need a power washing, tile sealing and then a new coating. 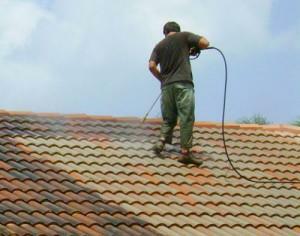 Once you are aware of the situation that is when you can start the process of roof restoration. Power washing, tile sealers, cool roof coatings are all a part of the roof restoration process to improve your homes or building’s tile roof’s condition. If your roof is in shambles and you want to have your roof restored, eco-washed and/or coated, contact the professionals at Custom Coating Restoration today!